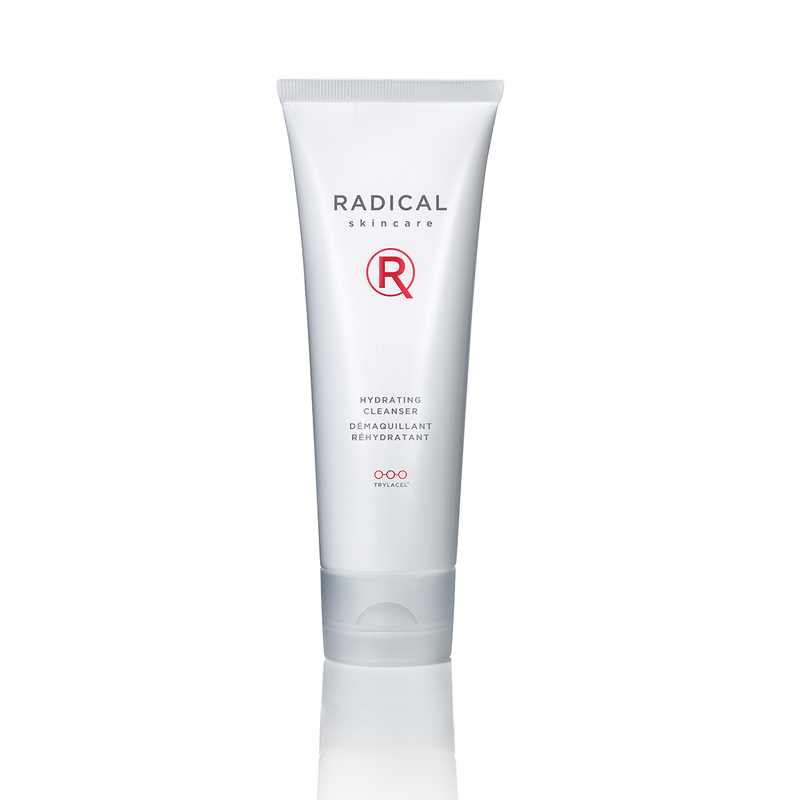 Hydrating Cleanser - Radical Skincare - Doubles as a Hydrating Mask! This gentle yet potent multi-functional creamy Hydrating Cleanser is packed with minerals, vitamins and exceptional ingredients that truly do it all! These ingredients are proven to soothe, re-balance, gently exfoliate, reduce redness and fight bacteria for a more even-toned complexion. As a result, you can cleanse, tone and hydrate in minutes. Finish by washing or gently using a tissue to remove product. Apply this hydrating cleanser to your face and neck, during the morning and night. Due to the cleanser’s versatility, you’re able to work the product into skin and remove with or without warm water. Pat dry. For accelerated anti-aging results, follow with one Age-Defying Exfoliating Pad at night. Our non-irritating, Paraben Free cleanser is suitable for all skin types. I am so much more confident about my appearance. Radical really has made a radical difference to not just my skin but how I feel about myself. This cleanser really agrees with my skin- the smell is delicious. It is hydrating and kind. When I rinse my skin feels so comforted. I love the face wash. Firstly it smells delicious,I use it in the morning and evening. Putting it on my face makes me feel like im in a spa. I’m hooked! The best! This is THE best cleanser I have ever used! I say this because I have dry skin. extremely dry skin. winter weather is intense and the wind is constantly in my face. My skin needs all the moisture it can get. This is the best cleanser i’ve ever used, it doesn’t dry out my skin and doesn’t make it feel tight. This is the best cleanser I have yet used. It tones, hydrates and cleanses. It is gentle to skin but still gets rid of all the makeup and impurities, leaving the skin hydrated and not greasy like some cleansers. I use this cleanser with Clarisonic skin cleansing brush and it works great on my skin. Would definitely recommend to anyone with sensitive and combination skin. One of the gentlest cleansers I’ve found! Gets the job done and leaves my skin feeling clean and non-irritated! Most of the time my skin is so sensitive that even splashing my face with water will turn it slightly red -_- but using this on dry skin first and then rinsing it off with water seemed to be the trick that works best for me! The outcome of the several experimental studies suggests that green tea posses anti-inflammatory and anticarcinogenic potential, which can be exploited against a variety of skin disorders. Humectants are ingredients that hydrate and hold moisture in the skin. Sodium PCA is an incredible humectant that occurs naturally in the skin and is greatly responsible for the skin’s moisture-binding capacity. It is derived from 100% natural amino acids and is highly water absorbing. Due to its moisture-binding ability, this ingredient is used to increase the skin’s softness, as it helps maintain a healthy moisture balance. A natural anti irritant, which also helps to soothe the skin. It also helps to counteract drying effect on the skin. Anti Inflammatory properties are also useful in allantoin as it helps calm the skin. A natural milk derived from almonds to help cleanse the skin without stripping the surface. It is used as a natural emulsifier and it also helps to remove excess oils and residue from the skin. Excellent for all sin types especially normal to dry. It is used in this formula as it soothing to the skin and reduces and irritations or reactions from typical surfactants or cleansers used in common cleanser formulas. We believe in complete customer satisfaction. This is reflected in our 30-day satisfaction guaranteed return policy. Returns must be made within 30 days of the ship date for a refund. We regret that we do not refund any shipping or handling charges. Please do not mail any packages C.O.D., as they will not be accepted. Please make sure to obtain a tracking number because we cannot issue a refund until our warehouse confirms receipt of the returned merchandise. If the warehouse does not confirm receipt, then you may need to track your package to check the status. We are not responsible for lost packages. All returns will be credited to the original credit card used for the purchase. Returns will be processed within 1 week of warehouse receipt. Please allow at least 2 billing cycles for the credit adjustment to appear on your credit card statement. We appreciate your continued support and are proud to offer the Radical promise - maximum potency products, maximum results. After the warehouse receives your return, it generally takes 2-5 business days to process your return. Please keep in mind that your bank typically posts credit in the billing cycle in which it was received. Therefore, the number of days it takes for credit to post to your account may vary, depending on your bank’s billing and credit schedule. Product(s) damaged during shipping will be replaced. Save the package and all contents, and contact our Customer Service at service@radicalskincare.com for further instructions. Should you experience any problems with your order, please contact our Customer Service Support at service@radicalskincare.com immediately, so that we may correct it in a timely matter. Most orders will arrive within 5 to 10 business days after your order has been processed. Most orders are shipped within one business day but, please allow 2 to 4 business days to process your order. This allows enough time to process your credit card payment through your financial institution. Who will deliver my package? Orders will be delivered via the most efficient shipping method available. Unfortunately, at this time, we do not accept requests for a specific shipping method. What if my product was damaged? Please DO NOT dispose of the damaged product until you have contacted our customer service representatives at service@radicalskincare.com. We will ship a replacement order out to you as soon as possible. Orders will be delivered via the most efficient shipping method available. Unfortunately, at this time we are unable to process requests for a specific ship method. What if my order was never received, even if it was reported as delivered? If for any reason you never received your order even though it showed delivery confirmation, please contact the carrier first with this tracking information. The carrier will assist you in locating this order. If you have contacted the carrier and still failed to locate your order, please contact our customer service support at service@radicalskincare.com immediately as we will be more than happy to assist you with the problem. Where is my replacement or refund? Requests for replacements or refunds will be processed promptly upon receipt of your returned package. Allow 7 - 14 days (not including delivery time for mail refunds) from when we accept your returned product for the processing of your credit. Please keep in mind the customer's bank has to post our credit in the billing cycle in which it was received; hence the number of days it takes for the credit to post to the customer's account can slightly vary depending on how quickly the customer's bank posts our refund. Note: If you should receive the original order in the meantime, please let us know, and kindly return the extra shipment to our warehouse. We thank you for your cooperation and patience. Your credit/debit card will be charged when your order ships. Credit card charges will be shown on your monthly credit card statement. Debit card charges will be deducted directly from your bank statement. Am I responsible for bank overdraft fees? Yes, you are responsible for any bank fees associated with the use of your card. For shipments in the USA, we are required to collect sales tax on all orders shipped to an address in CA. For shipments abroad, we follow VAT/TVA requirements. Can I return a product on a website order? We believe in complete customer satisfaction. This is reflected in our 30-day satisfaction guaranteed return policy for web orders. If you are unsatisfied with the product you ordered on our website, you may return the unused product 30 days from the ship date and you will not be billed for the order. If you wish to return your order, you must first obtain a Return Merchandise Authorization (RMA) number. Please contact us via email to request an RMA number. We cannot process or refund packages marked "Return to Sender." The warehouse personnel are not allowed to accept packages without an RMA number. To ensure prompt processing, please send returns to the address provided along with your RMA number. Please note that shipping and handling charges are not refundable, and that customer is responsible for return shipping charges. You will be charged the day your Radical Skincare Subscriptions ships. The charge will be the price of the product less 15% plus state sales tax. Radical Skincare collects sales tax in all states. An estimated sales tax will appear in your cart, your actual sales tax will be in your order confirmation email as well as on the packing slip included in your shipment. Radical Skincare Subscriptions orders do not qualify for promotions and gift with purchase offers that are not specific to the subscription program. If you would like to change your subscription's delivery schedule, simply log in to your account and click "Manage your subscription." You may change or cancel the scheduled delivery up until the day prior to the next shipment date. Contact Customer Service by email to customerservice@radicalskincare.com to receive your Return Merchandise Authorization (RMA) number. Be sure to include all products being returned (including all gifts with purchase). Write your RMA Number on the outside of the box. To ensure we receive your package, make sure to get a tracking number for your records.. There will be a $15 service charge applied to all refused packages. 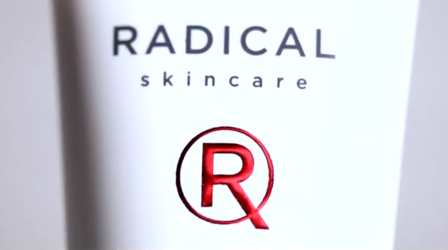 To receive authorization for a return, please contact customerservice@radicalskincare.com Please allow up to two (2) weeks for the return to be processed, at which time a credit or exchange will be made. If you wish to inquire about your return please call customer service at 1-(424)-330-6811. We are committed to customer service and value. We welcome specific inquiries and suggestions in regard to Radical Skincare Subscriptions or any other concern you may have. If you have any additional questions, please call us at 1-(424)-330-6811 or email customerservice@radicalskincare.com. *By completing this form you are signing up to receive our emails and you can unsubscribe at any time.